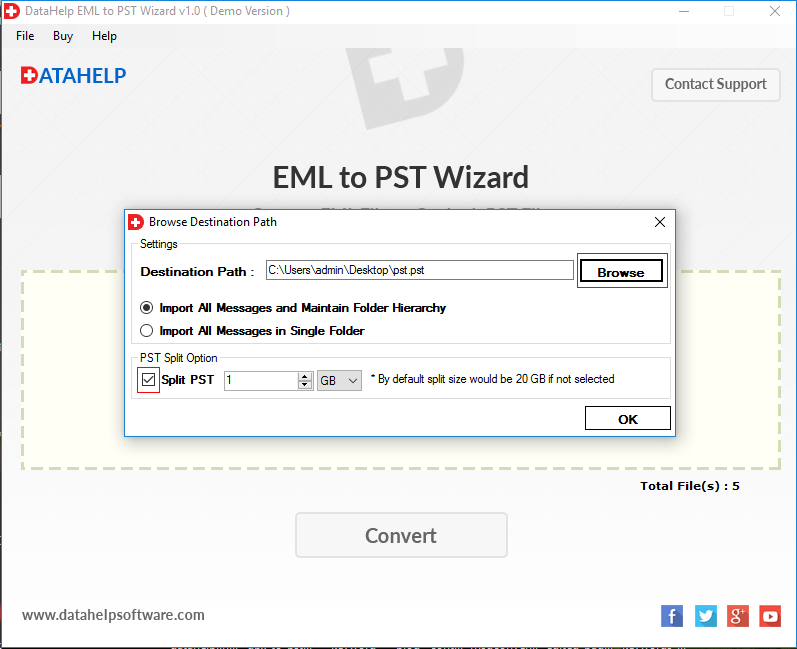 The EML to PST converter application migrate EML files / folder to PST file format. Option to add EML file or folder, user can choose the folder in which EML files are maintained and then EML to PST Wizard load all its emails with item count automatically. Moreover, a user can also export selective emails or complete folder of EML files to Outlook PST file in batch also. By using the tool, a user can easily migrate EML files to Outlook PST in an systematic and reliable manner. It allows users to save the output PST file at any desired location of their choice. Additionally, if a user wants, then EML converter software can create a new folder also to save the generated output files. Apart from all this, user can view current conversion status of EML file/files. While converting EML files to PST format, by default EML to Outlook converter software generates a Unicode PST file. However, these Unicode PST files are compatible with MS Outlook 2019, 2016, 2013, 2010, 2007, 2003 for Windows. Moreover, a user can store up to 20 GB of data in Outlook supporting Unicode PST file. This will help in avoiding issues related to large size Outlook PST file. 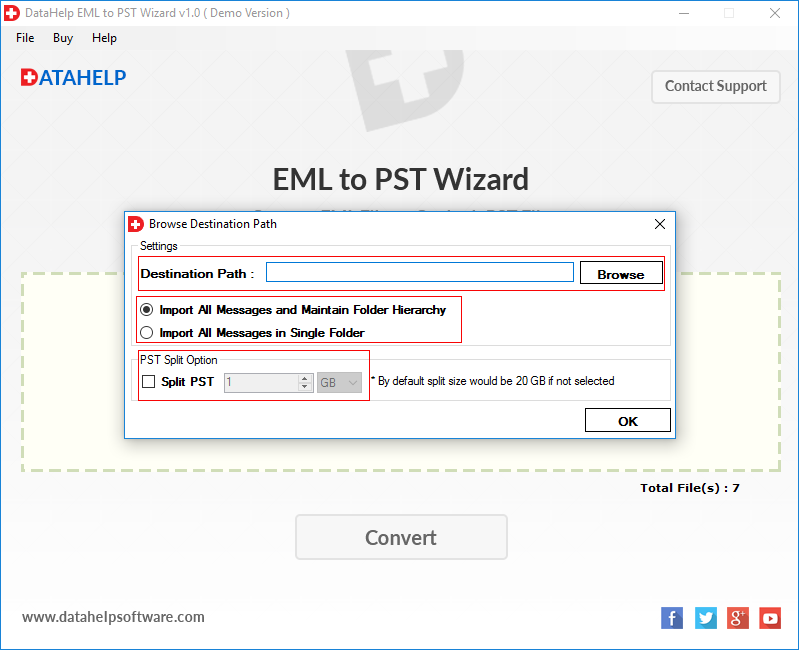 The Demo Version of EML to PST Conversion Tool export only 10 items. 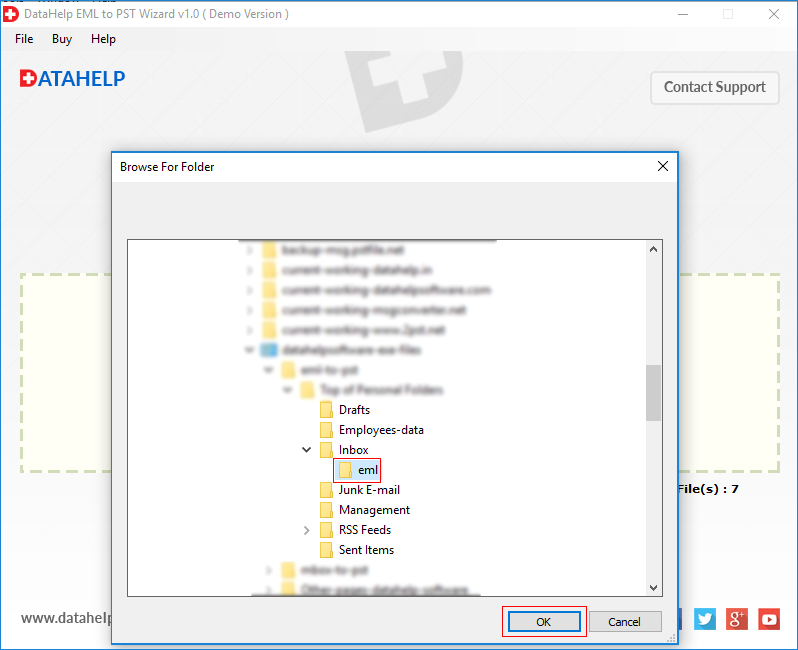 How can I merge multiple EML files into a single PST file using the Software? Software provides the solution to merge EML files into a single PST format. Run DataHelp EML to PST wizard. Select EML files which you want to merge. Click on Convert button to start conversion process. Now, Select Import All Messages in Single Folder option. Select Destination Location & Click on OK.
After that software will convert and merge all EML files into a single PST format, Then you can access EML files into Outlook 2019, 2016, 2013, 2010, 2007, 2003 editions easily. 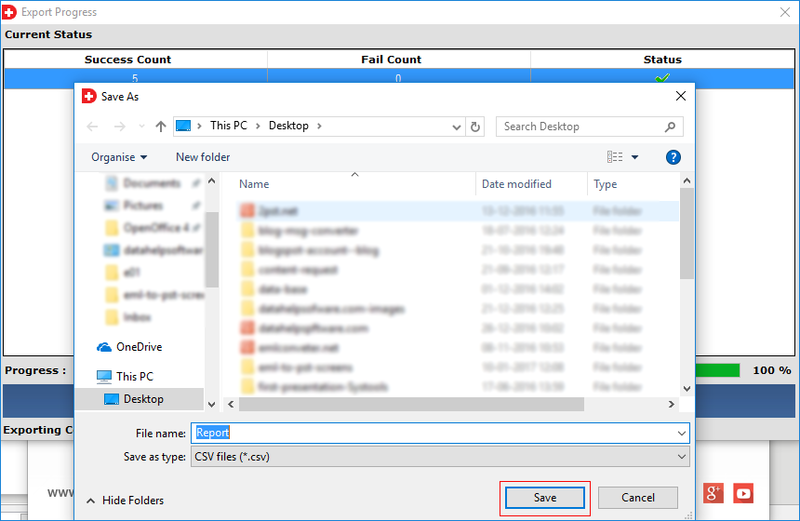 Is there any option to deal with large size resultant file in EML to Outlook converter? 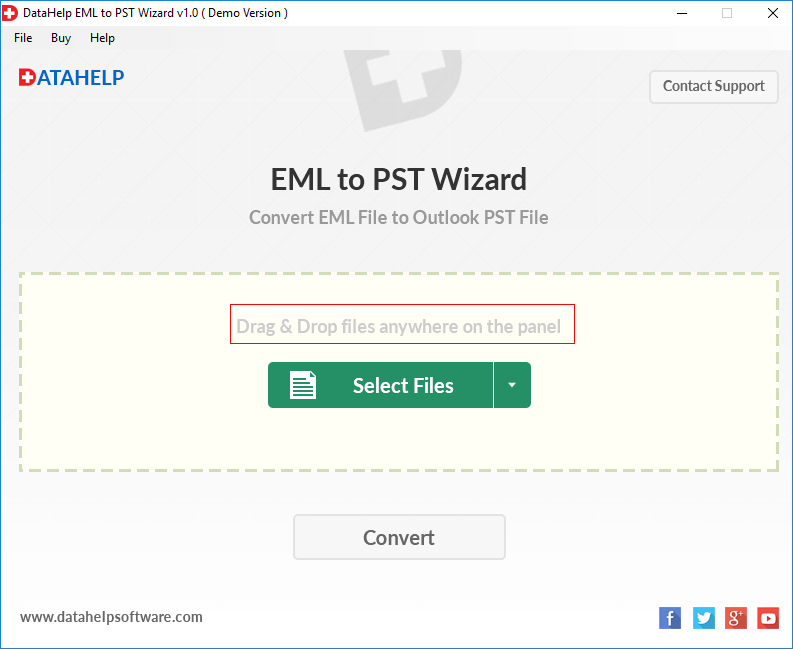 Yes, the EML to PST converter application provides users an option to break resultant Outlook data files (.pst) to avoid large PST file issue. Moreover, the software creates Unicode PST file that provides 20 GB data that also helps in avoiding such file size issue. Does the software support other email programs which is compatible with EML files? Yes, the EML converter compatible with all EML file supporting email programs such as Thunderbird, Outlook Express. Therefore a user can use it for any email application supporting EML files. Is there any option to sort emails depending on their attributes? No, EML to Outlook converter software provides option to move all EML files into a single PST file in bulk manner, but does not provides any option for sorting emails. 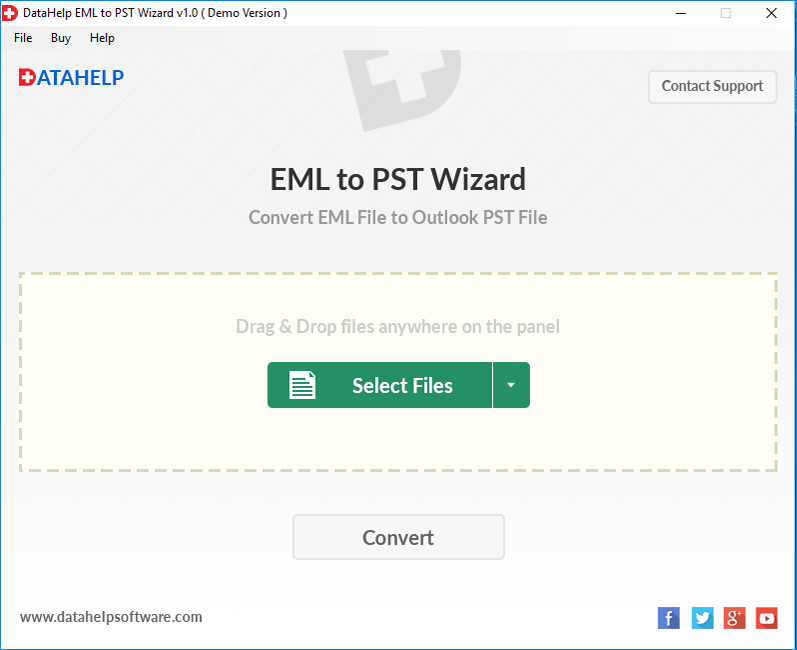 Is EML to Outlook converter wizard is safe and secure to use or not? No, Our tools are free from viruses, so you can run this tool to transfer EML files to PST without any risk of virus infection. 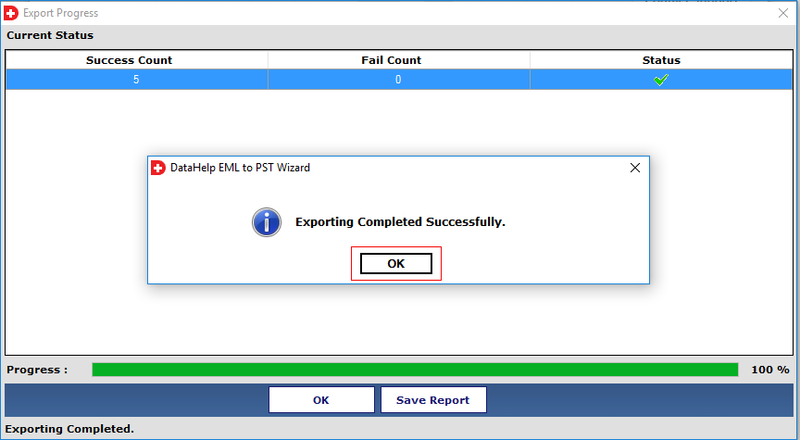 Does the DataHelp EML to PST converter software maintains on-disk folder hierarchy while migrating EML files? No, the EML to Outlook PST application retains the on-disk folder hierarchy and maintains the integrity of data also while converting EML file to PST format. Can I convert Lotus Notes EML files with this software? Open Lotus Notes email client, then select email to export as EML extension. Then, Drag & Drop it to the desktop. Now, you can get Lotus Notes email as EML format. 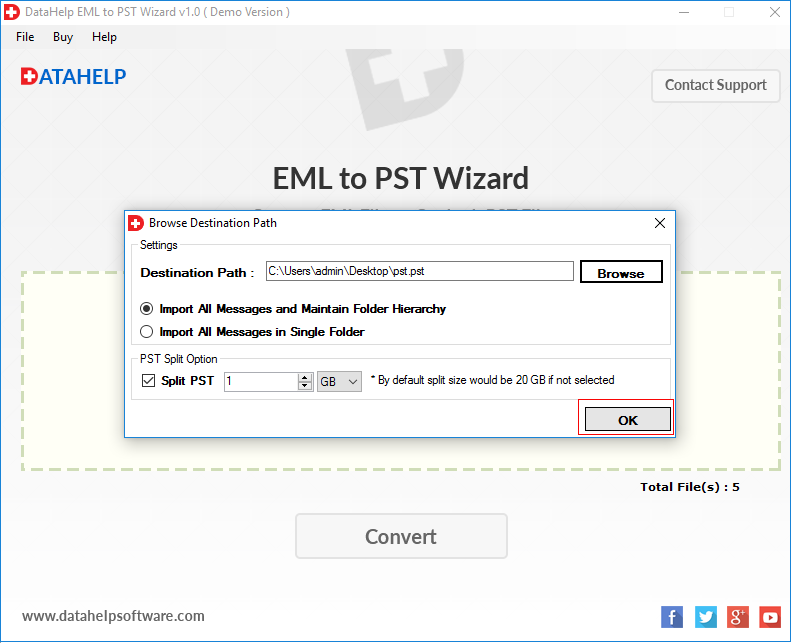 I have a large number of EML files in multiple different folders and I want to convert all these email messages into PST file with affecting data integrity, so EML to PST tool will help to perform this task. 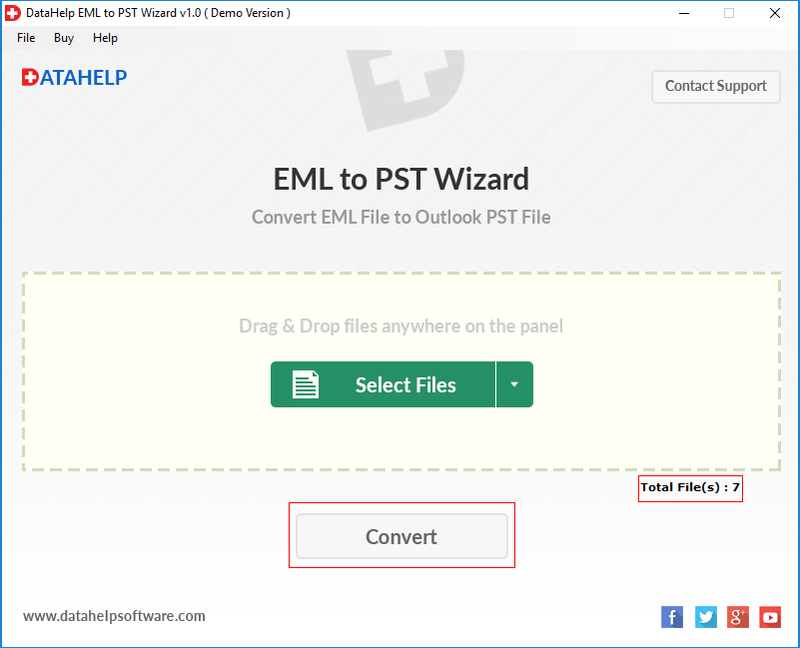 This Program will convert all your EML email messages to PST for Outlook & it will retain all data like attachments (images, files, etc..), HTML formatting, header properties in original form when you converting or importing EML to Outlook friendly PST format. After accomplishing this task you will get all email messages in original format into Outlook desktop email application. With this tool can I migrate Thunderbird EML to Personal Storage Table (.pst file)? Yes, EML converter software will migrate entire Thunderbird EML files into Microsoft PST file. "I was searching for a utility to convert EML to Outlook PST file. My primary need was to perform conversion without any loss of data. 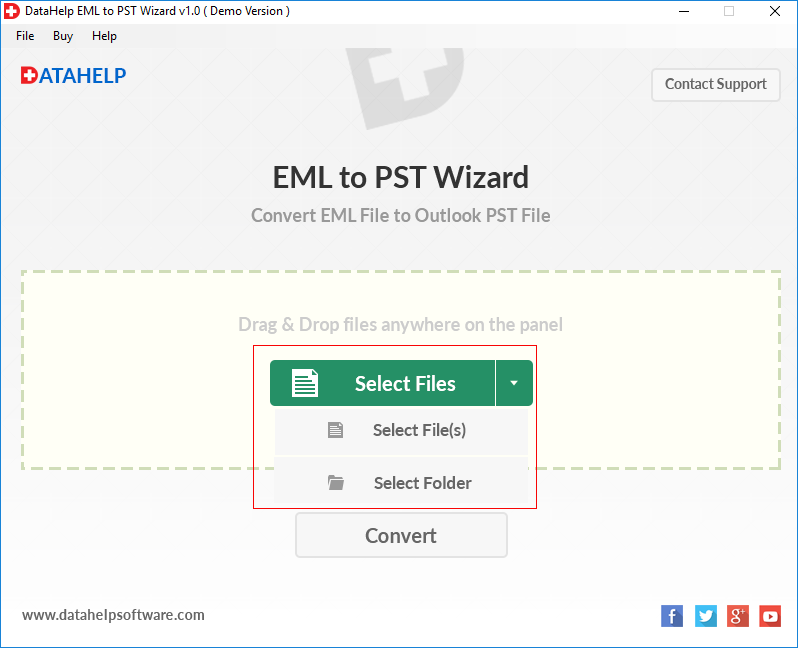 Thanks to EML to Outlook PST migration tool for helping me in such a reliable way, I have successfull save entire emails with their attachments into PST without data loss. Moreover, this utility have a user-friendly interface that it export EML files to Outlook PST format in just a few clicks." "I must appreciate the work done by the developers in developing an amazing utility named as EML to PST Converter. I feel so grateful that I finally found a reliable software for migrating EML files into Outlook. Moreover, the tool support EML files compatible with multiple email application, which is its one of the best part."